Even though our days are consumed with building client websites and providing customer support - that doesn't mean we don't have some free time in the evenings to work on some side projects together. 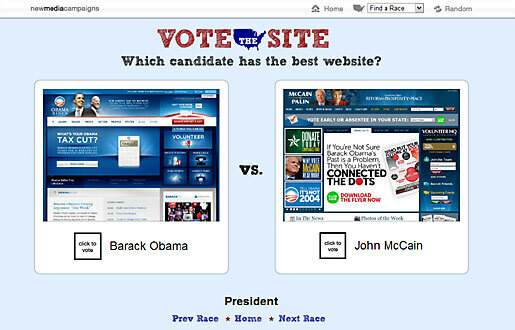 The New Media team just released a new microsite at www.votethesite.com - the site allows you to browse campaign websites from races across the country and vote on which candidate has the better site. We had a lot of fun building it, but it also serves a functional purpose - we want to see if there's a correlation between which campaign has the better site and who wins. As a political web design firm, we're very interested to see if the better campaign site is also winning the actual election. The more votes we record on Vote the Site, the more data we'll have to include in our results. If you'd like to signup to receive the final results after the election and the correlation chart, send an email to results@votethesite.com. To get this site up and running was a team effort. Everyone burned the midnight oil gathering screenshots, designing the interface, and programming the functionality, but we're really pleased with the product. Please be sure to check out votethesite.com, vote, and let us know your feedback.